Your choice of design or monogram and up to three lines of custom text are printed on these reusable, personalized 22 ounce plastic stadium style wedding cups. For one low price, you also can have the back side of your cups printed with up to four additional lines of custom printing. 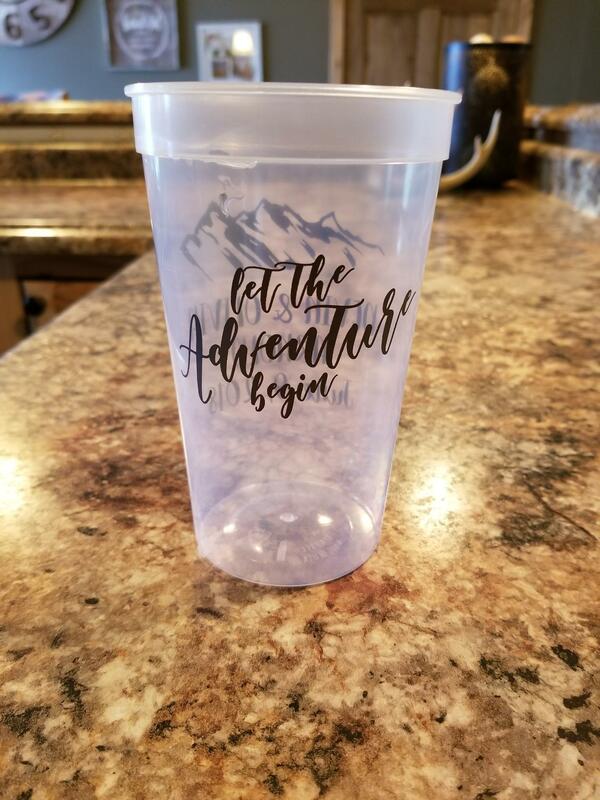 Available 8 popular color options, these drink cups are made of dishwasher-safe, BPA free, shatterproof plastic and will hold up to 22 fluid ounces when full to the brim; comfortably holding around 20 ounces. Cups measure approximately 5 3/4 inches high by 3 1/2 inches in diameter at widest point. Choose from any of our designs or monogram formats to have printed on your cups. Want your custom artwork or a company logo printed on these cups? Give us a call at 1-800-605-3415. Color coordinated reusable plastic lids and straws are also available for all stadium cup sizes so wedding guests can take their cups when they leave your reception and not worry about spillage. Very pleased with the order! Cups turned out perfect! Better than expected. Customer service was amazing as well! I could not wait to receive these! After planning my wedding for months, these were my favorite item to receive in the mail! They are so fun... And a perfect favor for everyone to remember our perfect day! Our cups came in on time, looked fantastic, and I couldn''t be happier! These cups are very durable and amazing I cant wait to hand them out at my wedding. Ordered my package and it said it will be delivered on the 20th and it arrived 4 days early. Was so happy with the cups. I loved the options and it made it super easy to choose from. We love the cups that we ordered and we know our guests will too! What a perfect wedding favor that your guests will actually use after the wedding and what a great way to cut down on waste for the environment. I couldn't be happier with the cups I ordered. Ordered these for our wedding which guests will have to walk on a short hike to get to ceremony location. Was worried the 22oz would be too big or awkward for our guests to hold on bus and walk to ceremony location but the size couldn't be more perfect. And the brass font color is so pretty. We had printing on both sides and it doesn't look like too much print either. They were exactly what I was looking for. Great quality also. The customer service was great and very helpful. I looked the cups. We are using these for our wedding next week. Our cups turned out SO awesome and we received them in less than three weeks! I definitely recommend and will be ordering again!! Perfect! Came exactly as I ordered them. Easy to personalize, order and receive. Will definitely use your company again. I order the lids to go with the cups... great combo! Ordered these cups for my wedding and loved them so much I just ordered another 200 for my nieces wedding! Such a great idea to personalize your wedding and serves as a take home for your guests! My cups turned out perfect and were delivered promptly! I chose the natural color cup and used silver print, and I love them! We haven’t used them for the wedding yet but are looking forward to it. These were EXACTLY what we thought they were going to be! Nice big beer drinking cups for our wedding! Couldn't be more happy! Thank you! THEY WERE AWESOME AND THEY ARRIVED IN A VERY TIMELY MANNER THANK YOU SO MUCH WILL USE YALL AGAIN . THANKS SO MUCH. 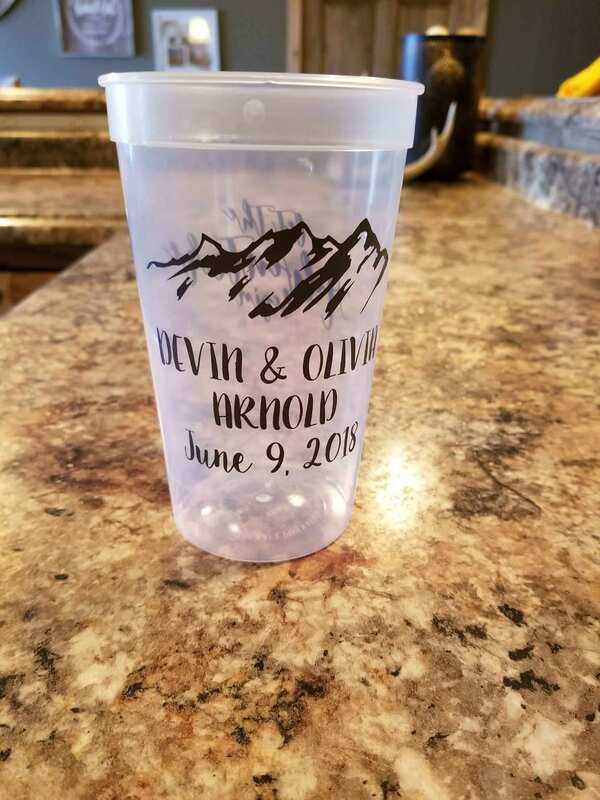 Really like the cups I ordered my sons wedding. Got them as a surprise to hand out. They loved them!! Received them fast!! Perfect favor! Asked for proof of back of the cup since I did two sided personalization and was sent the proof within a day or two! Received the order and they are perfect!! They look even better than I thought they would! I will definitely be ordering again! Cups arrived quickly and were perfect for my son's reception! Would recommend and use again! Awesome service! I bought these for a party and everyone loved them! I loved the cups even more in person.